Channel the beauty of the great outdoors with our Amish White River Dining Room Chair. Its beautifully simple back splat will provide great support as well as a wonderful accent for whichever room you choose to make use of it in. 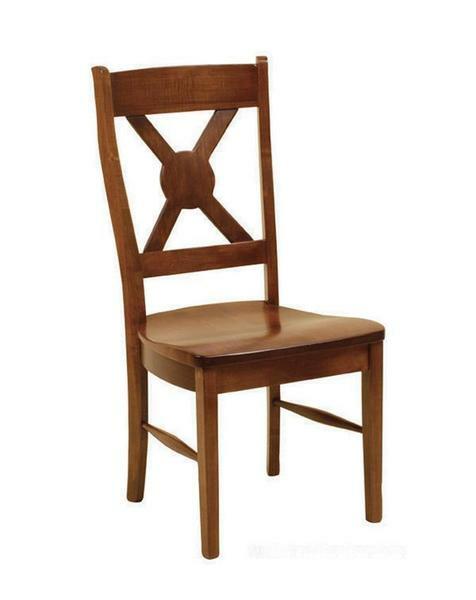 Oak, brown maple, cherry, quartersawn white oak, and hickory wood are your choices when it comes to the 100% solid hardwood this dining chair can be crafted in. Each of these hardwoods is sourced from the United States and handpicked to ensure quality. Top it off with the stain of your choice and you are sure to have a one of a kind heirloom quality chair. We offer free stain samples in order for you to confirm your choices. Please get in touch by calling 866-272-6773 to speak with a friendly Amish furniture expert. Height from floor to top of back: 39 ½"